WASHINGTON, October 9, 2015 - The highly anticipated 2015 WIHS Regional Horse Show & USHJA Zone 3 Finals will be hosted at Prince George's Equestrian Center (PGEC) in Upper Marlboro, MD, from Friday, October 16, to Sunday, October 18, offering local and regional riders a final opportunity to punch their qualifying ticket to show at the world-renowned Washington International Horse Show (WIHS). 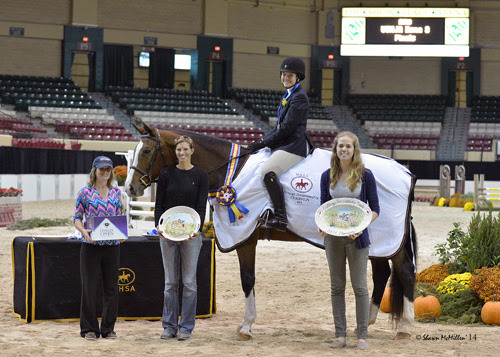 Entries for the WIHS Regional Horse Show & USHJA Zone 3 Finals close Friday, October 9. View the prize list for more information at www.wihs.org/wihs-regional/. The Washington International Horse Show begins Tuesday, October 20, and continues through Sunday, October 25, at Verizon Center in Washington, D.C., offering a week of elite equestrian competition showcasing the best of the hunter, jumper, and equitation disciplines. Highlights of the WIHS Regional competition hosted at PGEC include the Maryland Horse Show Association Gittings Horsemanship Finals on Friday, October 16, beginning at 6 p.m. Grand championship honors will be awarded to the Children's and Adult Hunters alongside the Children's Hunter Pony division. The USHJA Zone 3 Finals will be held on Sunday, October 18, with special zone points being awarded to top place finishers. Rachel Heist won the 2014 MHSA Gittings Horsemanship Finals aboard Cordelanne. Photo copyright Shawn McMillen Photography. Other highlights include the MHSA Children's Pony Medal, presented by Oldfields School, presented by the Linden Group at Morgan Stanley, Zone 3 Adult Amateur Hunter Finals 36 & Over, and Zone 3 Large Children's Pony Hunter Division presented by the Saddlery. New for 2015, the WIHS Regional Horse Show will host a qualifier for the WIHS Shetland Pony Steeplechase Championship Series, presented by Charles Owen. 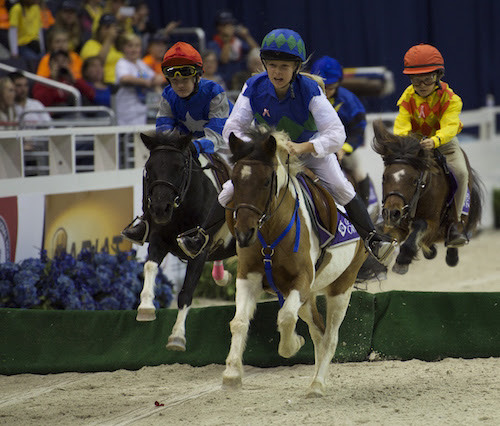 The Shetland ponies and their mini jockeys will compete in a race to earn their spot to compete in the feature events at Verizon Center. They will run in the indoor arena at PGEC on Friday, October 16, at 5:00 p.m. The top finishers will then compete in the finals at WIHS during its main week of competition on Thursday, October 22, and Saturday, October 24. An ice cream social will be held Friday night during the qualifying event. There will also be a pizza party on Saturday, open to all exhibitors, thanks to Buckeye Nutrition. New for 2015, the WIHS Regional Horse Show will host a qualifier for the WIHS Shetland Pony Steeplechase Championship Series, presented by Charles Owen. Photo copyright Alden Corrigan. The fourth annual Laura Pickett Award for Excellence in Horsemanship will also be selected during the WIHS Regional competition, honoring and remembering local equestrian and trainer Laura Pickett, and will be presented to a rising adult or child rider alongside their respective trainer's for exhibiting enthusiasm, dedication, commitment and a sense of style, bringing out the best of horse and rider combinations. The award is presented on Thursday during Barn Night by WIHS President Vicki Lowell, honoring the many qualities for which Pickett is remembered. Nominees for the award will be asked to wear a pink armband and will be judged for their performances inside the ring and their conduct throughout the weekend. The winner will be notified by Monday, October 19, and will receive a pair of custom boots provided by Fabbri Boots. Children's and Adult hunters and jumpers will take center stage during the weekend, as final qualifying spots are up for grabs to compete in the WIHS Championship Finals as well as the Regional Hunter Finals at Verizon Center. The WIHS Championship Finals will feature the $10,000 WIHS Children's Hunter Championship and the $10,000 WIHS Adult Hunter Championship on Tuesday, October 20. The $10,000 WIHS Children's Jumper Championship and the $10,000 WIHS Adult Jumper Championship will both be held on Wednesday, October 21. Regional hunter combinations who earn a qualifying spot in the WIHS Regional Hunter Finals will compete at Verizon Center on Sunday, October 25. All of the fantastic regional competition in Upper Marlboro, MD, leads up to the 57th annual Washington International Horse Show, featuring many of the nation's top horses and riders as well as some of the world's best international competitors. For more information, please visit www.wihs.org, join us on Facebook, and follow us on Twitter and Instagram. 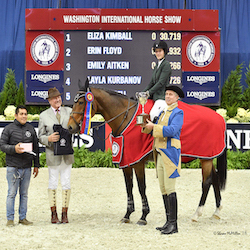 Established in 1958, the Washington International Horse Show is one of the most prestigious equestrian sporting events in the U.S. More than 26,000 spectators attend the six-day show, which includes Olympic-level competition along with community and charity events. More than 500 top horses and riders come to D.C. from all over the globe to jump for more than a half a million dollars in prize money. Event highlights include the $125,000 Longines FEI World CupTM Jumping Washington, presented by Events DC, for the President's Cup (Saturday night), The Boeing Company Puissance high jump competition on Military Night (Friday) and Kids' Day (Saturday), a free, fun and educational community event. The Washington International Horse Show Association, Ltd. is a 501(c)(3) nonprofit charitable organization headquartered in Washington, D.C. WIHS is an official USEF Heritage Competition and is recognized as a Top 25 Horse Show by the North American Riders Group. WIHS is rated CSI4*-W by the Fédération Equestre Internationale, the world governing body for horse sports.